Again for little one !! Didn't I promise you something ??? My new sewing machine !! Bring on the light and colors!! For today's menu: pocket bags !! Last week was very emotional and crowded for Soleil Basque. First of all, my first Private Sale, then my friends Fred & Alex came for France, espacially for U2's Concert and finally, the U2's concert of course !!!! Ouuuuh ouhouh!! Ouuuh ouh ouh!! But since Fred & Alex are my BFF, they didn't come with empty hand... They put in their luggages something really special, something I asked for last time they came (less than 2 months ago...). With all this stress I had, I really needed a sweet moment. 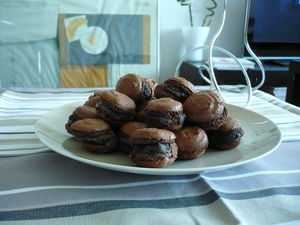 So, my friend Anne-Lise (another one) with her assistant Alex, cooked for me this little amazing things, THE macarons! !